It’s hard to miss the stampede of technical innovation at the moment. At the time of writing, Elon Musk has just unveiled his most detailed plans yet for colonising Mars and flying people from Melbourne to London on rockets in 2 hours (and I actually think if anyone can do it, he can). Apple has released yet another iPhone (not so sure about the merits of this one) and James Dyson (the vacuum guy) has just unveiled his own plans to invest $US2 billion to create his own electric car business. Put simply, we all know the world is rapidly changing. Hybrids: The Future of the Piano? Electric power from battery generation, energy reabsorption and regeneration from braking, etc. …so too digital pianos bridge the divide between acoustic and digital, offering the best aspects of an acoustic piano (namely the touch and feel of the action), with all the benefits of a digital instrument (see below). And, as I’ll be explaining in a later post, the price range of some of the newer hybrids such as Casio’s Celviano Grand Hybrid, offers stiff competition to even acoustic upright manufacturers by offering a similar price point and a superior action. If you’re a teacher who requests that all students purchase an acoustic piano before starting lessons or if you’re a teacher for whom the thought of teaching or playing a digital instrument is anathema, then I’d like you to reconsider the landscape. Technology, as you know, is impacting on every aspect of our lives and while you might want to keep pianos out of it, the time has come to open your eyes to the potential digital instruments offer you, your teaching and your studio. A hybrid piano is simply a digital instrument with some kind of acoustic piano action inside. Or, viewed from another perspective, it’s an acoustic piano with an amplifier and speakers instead of strings and a soundboard! 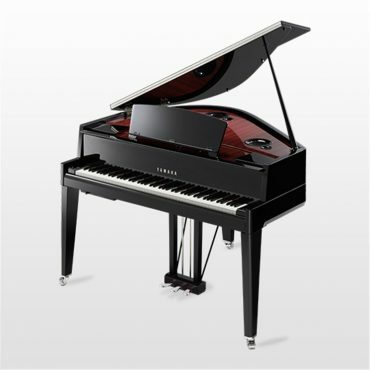 Depending on the make and model, hybrid pianos feature either an upright or grand piano action that has been only slightly modified from the original acoustic construction. Unlike digital pianos and synthesizers, hybrid pianos don’t generally feature extensive rhythm and sound libraries or on-board multi-track recording. This is left to digital pianos which are designed more for stage performance and recording studios. So hybrid pianos are mostly about the piano playing experience rather than having lots of bells and whistles. Why My Interest in Hybrid Pianos? While we can all agree that a well-tuned and regulated concert grand piano is the ideal teaching and performing instrument, who has the money (or space) to buy one? In any case, I didn’t have enough room for a grand piano at home, I was permanently frustrated by how regularly my upright tended to go out of tune, and I also wanted an instrument that I could use headphones with and move easily around my house. So if you want to practice on a quality instrument with headphones but without compromising on the action, what do you do? Perhaps you will have heard of Silent Pianos. While these are great, they’re predominantly an acoustic piano with digital add-ons, so they are still big, heavy and need tuning and proper care just like any other acoustic piano. 50 years ago there really weren’t many options other than teaching on an acoustic piano, nowadays the range of options is huge. When I studied for my Diploma, I did the majority of my practice on an upright Kawai K3 and a Roland FP7F (now called a Roland FP80) digital piano. Neither had a grand piano action and the Roland was definitely not a hybrid piano. However I found both to be completely suitable for this high-level practice (I received a Distinction if you’re wondering about the impact!). Over the years, I started playing a variety of hybrid pianos as soon as they became available (I even remember having to wait for a trip to London to try the Yamaha AvantGrand because they weren’t available in Australia at the time). Yamaha N3X AvantGrand. Source: www.yamaha.com. I’m more than convinced of the merits of hybrid pianos and hope that you’ll consider how digital instruments could positively impact your studio as well. What Do I Look For in a Digital/Hybrid Piano? Firstly, the feel and response of the action is critical. Does the hybrid’s action faithfully recreate the acoustic action? One way I test this is with fast repetitions. Clunky or basic digital actions cannot faithfully recreate fast repetitions so this is always a test I perform. Test that the key can repeat without being fully released (this is a feature only available on grand piano actions and should function the same on grand hybrids). The quality of the action is crucial if you’re going to only be using hybrid pianos in your studio and teaching (or for your own performance practice). Sound is the second most important element in my opinion. If it doesn’t sound great, then who’s going to want to play it? Make sure you test the sound with headphones and without – many hybrid pianos actually tend to sound better with headphones on than off as you really feel immersed in the soundscape with headphones. Polyphony (the number of notes that the instrument can play at the same time) needs to be a minimum of 256 notes in order to work well reproducing the nuances of complex pedalling. 256 is the standard at the time of writing, but no doubt this will increase over time. Most hybrid piano manufacturers have gone to great lengths to faithfully reproduce the look, shape and feel of an acoustic piano cabinet (without the bulk of the 6 or 9-foot strings!). Sometimes this has a bearing on the amplified sound as bigger cabinets tend to produce a bigger sound and allow for more speakers. However, the Casio Celviano Grand Hybrid actually uses very few speakers but produces an incredibly full, rich, warm and authentic sound. I also take in consideration the music rest and control panel – how easy is it to read music on the stand and how easy is it to use the controls? Some are much better than others! How many headphone ports does it have (important for group teaching) and where is the socket located? Do you use a hybrid and what do you think? If you’re more traditional in your thinking re instruments: what’s holding you back? 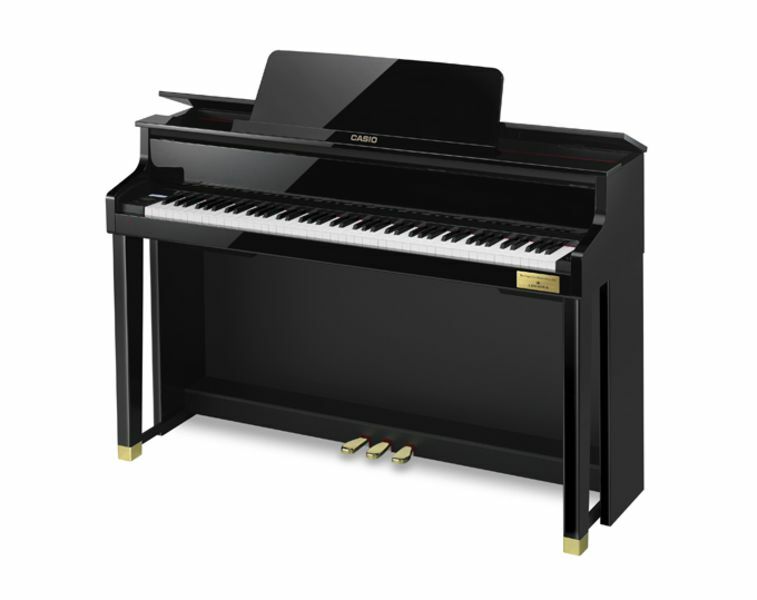 What are the things that most annoy you about either acoustic or hybrid pianos?